Installing our Booster Duct Cleaner will help boost airflow and clean dust build-up in your ducts. The Booster Duct Cleaner is easy to install and uses advanced pulse jet technology, each cleaner is able to handle 20-50 feet of duct. If you need more, you can simply install multiple Booster Duct Cleaners for any duct runs. Designed, Engineered and assembled in the U.S.A. and Canada. Our component suppliers are strictly American and Canadian. Boosts airflow by 2-4 times in low flow duct systems. Low flow conditions causes dust to dropout in the ducts. 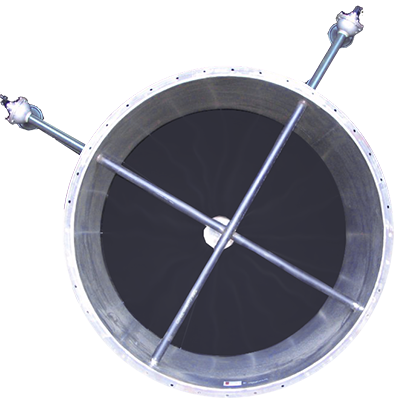 Cleans Dust Drop-out in duct-work to the dust collector, by simply inserting in the duct section to be cleaned of dust. Prevent structural damage in duct-work, from the weight of accumulated dust. Eliminate the risk of fire and explosions in duct-work. Unplug blockages in pneumatic conveying systems. Momentum pulsed duct cleaner, using advanced pulse jet technology. Get a Free, no-obligation quote today! Initial duct velocity is 1500 FPM. Dust is dropping to the bottom of the duct, causing a fire hazard. A periodic 100-150 millisecond pulse of compressed air is blown down the duct. The duct velocity is boosted to 5000 FPM. Some larger models require an accumulator/header to operate the diaphragm valve, as shown in the image to the right. 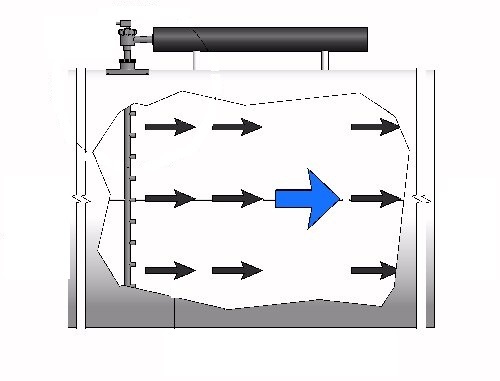 We use the output from one of the positions on the dust collector’s pulse sequencer, controlling the cleaning cycle of the bag cleaning system, the length of pulse would be typically 0.10 to 0.15 seconds. The duct cleaner can also be actuated by a manual push button or separate timer on the diaphragm valve. Copyright © 2019 Quality Air Management a Division of O2 Environmental Technologies Inc. All rights reserved.